Sandwich Harbour – Surf’s up! In 1971, concerns for the conservation and wise use of wetlands worldwide led to an international treaty designed to support national action and international cooperation. To date, 167 countries have joined the Convention on Wetlands of International Importance (the Ramsar Convention). 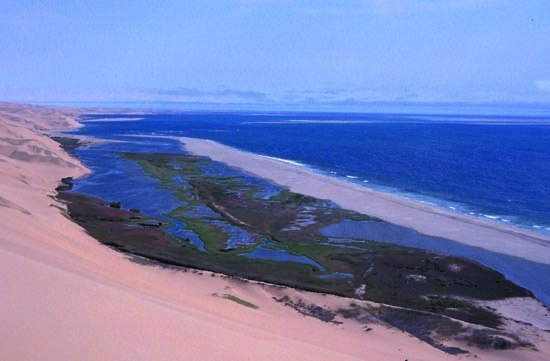 Namibia has identified five Ramsar sites, including Sandwich Harbour, thus designated in 1995. 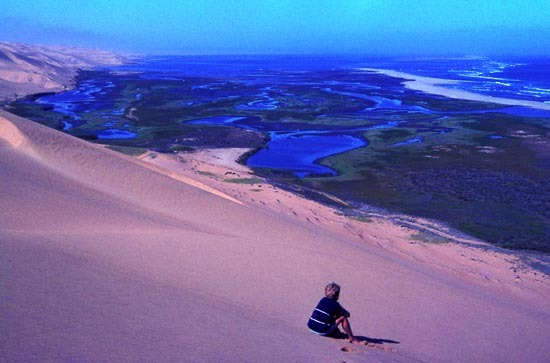 Arguably the least accessible of Namibia’s five Ramsar sites, Sandwich Harbour – located approximately 55 km south of the Municipality of Walvis Bay – is a world-class destination for birders, an off-road driving adventure for 4X4 enthusiasts, and a place of interest for those with a penchant for history. Sadly, it can also be a place to turn an expensive four-wheel-drive vehicle into a submarine for those who choose not to pay close attention to the tide charts. The origins of the name Sandwich Harbour are obscure. More a lagoon than a harbour, some attribute the name to a British whaler, The Sandwich, which visited around 1789, and whose captain may have made the first accurate maps of the area. 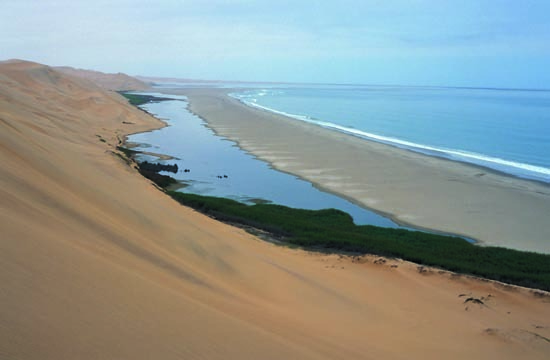 Others claim the name describes the ‘sandwiching’ effect of an area of fresh water caught between the dunes of the Namib sand sea and the tides of the South Atlantic Ocean. Finally, some believe it is a derivation of the German word, sandfische, a type of shark found in the area. Regardless of the name, the key to the profusion of life here is a large aquifer bubbling fresh water through the sand and creating the northern freshwater wetland. To the south, tidal influences form enormous mud flats, and to the east, the Namib dune sea reaches the ocean, offering a measure of protection from human encroachment, and some spectacular photo opportunities. The Sandwich Harbour environment is the home for a number of red-data bird species, including the Damara tern and chestnut-banded plover, as well as pelicans, avocets, turnstones, and dune larks. Peregrine falcons, southern pale chanting goshawks and black-chested snake-eagles may also be present. Many archaeological sites in the area demonstrate Sandwich Harbour’s long involvement in human endeavours. The earliest habitants may have been the Strandlopers – a nomadic beachcombing people believed to be the direct ancestors of the Topnaar – who remain in the area today. When American and British whaling ships discovered the freshwater supply that was available there in the early 18th century, trade began with the Topnaar, who bartered cattle for beads and other goods. In time, fishing, guano collection, sealing and even shark-oil extraction industries grew up in the area, where today only rusted relics remain. Studies in recent years have shown that the northern freshwater wetlands have decreased dramatically in size. Twenty years ago, the freshwater lagoon was approximately one kilometre across; today, it is only about 200 metres. 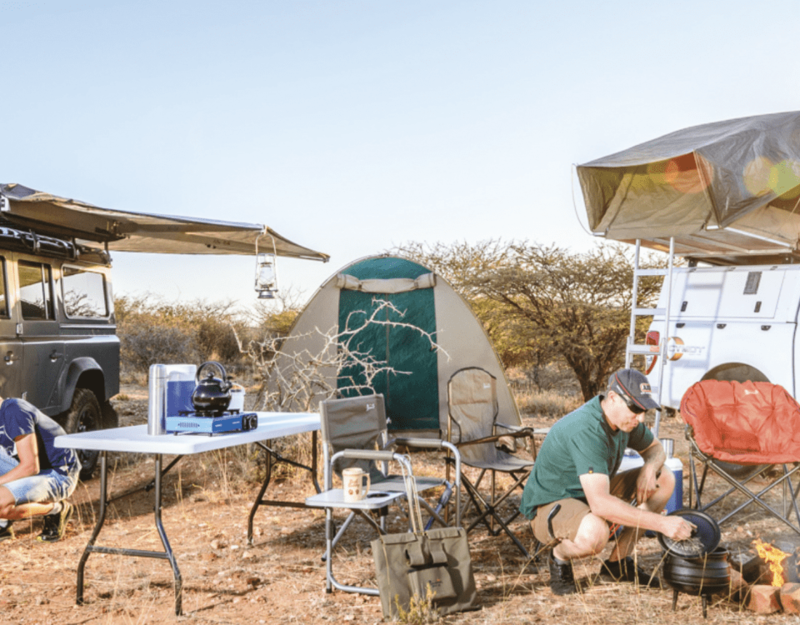 The aquifer appears to be fed from the ephemeral Kuiseb River, and as the demand for fresh water increases for growing communities such as in Walvis Bay and Sossusvlei, less water is available to replenish the aquifer. Some scientists believe that the lower numbers of bird species found during annual bird counts in recent years are a direct result of these changes, since the freshwater lagoon traditionally hosts a much higher diversity of species, while the mud flats host many thousands of other birds, primarily from wading species. During the 1970s the northern section of Sandwich Harbour was an extensive system of tidal mudflats, which drained brackish and fresh water pools. At its widest point the beach was about one kilometre from the base of the dunes. Twenty years later, 1992, the sea has pushed back the beach towards the dunes, covering large portions of the vegetation with a blanket of wave-washed sand. Only a narrow channel still drains the pools at the far (southern) end. By 1997 the beach has closed against the dunes in the south and no tidal flow is possible. The vegetation is dying from increased salinity and the beach broadens as it moves closer to the dunes.